I argue that how people care for their dogs is not keeping up with the best practices that science is developing. Too many trainers continue to use outmoded ideas of dominance and aversive control. 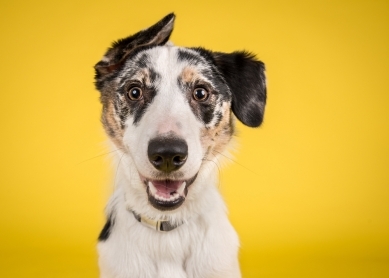 People rely on the notion of breed to tell them how a dog will behave when differences in behavior within a breed are as great, or greater, than differences between breeds, and 95% of shelters dogs are not pure-bred. We know dogs are highly social beings, and yet it is widely considered acceptable to leave them shut up alone all day. Although civilized people subscribe to the five freedoms, which includes the freedom to express species-typical behaviors, the Animal Welfare Act allows dog breeders to confine dogs their whole lives in cages only six inches longer than the dog itself (not even counting its tail). Can we really claim to be treating our animals any better than people in far poorer countries whose dogs may not get veterinary care, but they are free to live how they choose and are seldom lonely? What does science tell us about the multitude of innovative strategies currently implemented in animal shelters across the US? This talk will review the current research aimed at increasing the likelihood of adoption and improvement of the well-being of dogs while in the shelter. Highly repetitive behaviors that appear to serve no function, such as tail chasing, circling, fly biting, and light chasing, can be pervasive and challenging for owners and trainers. This talk will highlight the latest research exploring the causes of these behaviors. We will also discuss how scientifically informed behavioral assessments can be conducted to develop individualized training programs to reduce these challenging behaviors. The first meeting of a potential adopter with their future dog is arguably a crucial moment that sets up the pet-owner bond. However, best practices for this important part of sheltering are missing. This talk will cover the most recent multi-site national study to develop these best practices. The shelter environment is hopefully just a temporary home for most animals. But exactly for that reason living in this temporary environment can be very stressful for many animals. Dogs and cats alike can suffer from fear, anxiety and stress related signs that decrease the welfare of shelter animals significantly and with this may reduce their adoptability. Stress related signs can include a host of somatic problems such as sleep disturbance, anorexia or even aggression. To ask the question whether this is a psychological or a biological problem does not allow for best practices. We must assess and address the overall welfare of each individual animal and answer the question “Is the condition due to psychological factors or biochemical disturbances?” Assessing the welfare to answer this question is of utmost importance in guiding treatment decisions with psychotropic medications in shelter animals. In this presentation we will learn about key diagnostic principles and realistic expectations for treatment plans. The effectiveness of reinforcers is essential to training. So, how do we assess how effective a reinforcer is? A common way is assessing preference for an item or an interaction as a reinforcer. However, preference doesn’t always give us the whole picture. To look at how preference and reinforcer effectiveness interact, we will use behavioral economics, which deals with how much behavior a reinforcer can maintain and how we can apply these topics to improve our dog training. Dog ownership and interactions with dogs in therapeutic settings have been found to have a variety of beneficial outcomes for humans. In this talk I will discuss, and show examples from, a current program where we are investigating the efficacy of engaging a family’s own dog as an active therapeutic partner for children with developmental and motor disabilities (e.g. autism, down syndrome, cerebral palsy). In the current program children learn about basic dog behavior, how to properly walk their dog and in one condition learn how to train their dog using an imitative training methodology (‘Do As I Do’ training). We are evaluating the effects on the dog-human bond, increased physical activity and quality of life. The most recent dog training intervention was conducted at one of our local animal shelters (Willamette Humane Society, Salem OR). I will discuss some of the strengths and challenges of conducting AAI programs for children at an animal shelter, and how research into active pet-owner partnerships could benefit pet dogs, as well as those seeking homes. Clickers are often used to aid in the training of dogs; however, evidence of their superior efficacy in the acquisition of novel behaviors when compared to other secondary reinforcers or primary reinforcement alone is almost entirely anecdotal. In a series of experiments carried out by the Canine Science Collaboratory, naïve puppies were positively reinforced with only food, with food preceded by a verbal secondary reinforcer (“chee”), or with the sound of a clicker followed by food. To compare the dogs' performance under these separate reinforcement conditions, novel behaviors that increased in duration, distance from the experimenter, and specificity were used. In this talk, I will discuss the results from these experiments and how their findings may aid in our understanding of how clickers function in the training of our dogs. A better understanding of the power and limits of the dog’s nose is critical for optimal training and performance of working and nosework dogs. Expecting dogs to search for finds that are too easy is not so fun, and finds that are impossible can be frustrating for all involved. This talk will leverage the latest science on the dog’s sense of smell to help nose work trainers better understand the dog’s sense of smell and how this is leading to the latest optimized training protocols. The Penn Vet Working Dog Center is a research and development center for detection dogs. Dogs enter the program at 8 weeks of age and start their foundation training, including odor recognition, from the start. As the dogs mature, they are trained in the discipline that best suits their physical and behavioral strengths. Potential careers for these dogs include search and rescue as well as drug, explosives, and medical detection (i.e. ovarian cancer, infection). In the 5 years since the Center opened, the process for building the foundations for odor detection has evolved. This presentation will discuss what has worked well – and some of what hasn’t worked – to optimize the dogs' performance. Oxytocin (OT) and Vasopressin (AVP) are phylogenetically-ancient neuropeptides which play important roles in mammalian emotions, social behavior, and cognition. Whereas OT is frequently associated with affiliative behaviors between social partners, AVP has been more strongly implicated for its roles in anxiety and aggression. I will present data from two experiments investigating the roles of these neurohormones in in dogs' social interactions with other dogs (Experiment 1) and humans (Experiment 2). Findings from Experiment 1 suggest that dogs with a history of chronic aggression toward other unfamiliar dogs are characterized by higher total levels of AVP, consistent with previous studies in humans. Findings from Experiment 2 reveal that friendly interaction with a human leads to a simultaneous reduction of AVP, and increase in OT in dogs. Collectively these studies suggest that OT and AVP play important, and often antagonistic roles, in dog social behavior. One of the greatest stressors for dogs living in animal shelters is social isolation. Many studies have demonstrated that human interaction reduces cortisol in shelter dogs and incorporating longer periods of interaction yields even greater effects. However, these interventions are often contingent upon removing the dog from the kennel and any such reductions in cortisol are often lost when the dog returns to the kennel. More recently, animal shelters are utilizing short-term fostering programs to provide relief from the perceived stresses of kennel life and aid in rehoming efforts; however, the effects of these programs are not well understood. In this presentation, I will discuss the findings of a study conducted across the United States in which we investigated the impact of one- and two-night fostering programs on the cortisol levels and health measures of dogs awaiting adoption. Dogs and wolves differ naturally in their social behaviors due to small changes in the timing of early postnatal development, called the critical period of socialization. Along with the development of social behavior this interval features the rapid development of the brain, sensory system, motor coordination and fear. I will discuss the project I am currently conducting, which brings together genetic, epigenetic and behavioral data from dogs, wolves, and dog-wolf hybrids to identify genes and pathways underlying the altered early social development that has accompanied domestication. Domestic dogs have been living with humans for thousands of years. Today there are over 70 million pet dogs in the United States alone and most of these dogs are treated as cherished family members, sharing close bonds with their owners. Dogs are also employed in critical working roles. However, the majority of the world’s dogs are not pets, but are scavengers living on the fringes of human society. Here too they thrive, sharing a very different but equally critical relationship with humans. There has been considerable scientific debate about the nature and origins of domestic dog social cognition, particularly the question of what makes dogs unique when compared with wild canids. In this talk we will look at examples of species and individual variability in canine social cognition, and discuss how individuality and adaptability may be at the center of dogs’ success in human environments. Play groups are increasing in popularity in shelters and are an important source of enrichment for shelter dogs. They also offer us an opportunity to help these dogs learn skills that will be useful after adoption. While there are different models for running playgroups, we do not believe they are all equal. In this talk we will discuss taking a constructional approach to play groups in which play group leaders focus on teaching dogs new, desirable skills. How play groups are run at the SF SPCA will serve as our model for addressing how to keep dogs and humans safe, how to make decisions about play group structure, how to practically teach dogs new skills, and how to ensure the playgroup is a positive experience for all dogs. It is well established that in many species, including our own, early interactions with a parent can have long-lasting and wide-reaching effects. And yet, best canine mothering practices, which are just starting to be studied, are not well established. In this talk, I will present research that examines the role that mothers may play in influencing their puppies' later behavior, as well as their eventual working dog outcome. Previous research has identified many stressors in the daily lives of shelter dogs, including but not limited to excessive noise, spatial restrictions, and loss of attachment figures. While prior studies have found behaviors that may be related to single physiological parameters, no study to date has used a converging evidence model of multiple physiological, health, and cognitive measures to identify which behaviors of kenneled dogs are indicative of their welfare. In this presentation, I’ll discuss the preliminary results of our research at Arizona Humane Society where we collected cortisol, metanephranes, heart rate, activity, and cognitive performance data on over sixty shelter dogs to determine these in-kennel behaviors. Making euthanasia decisions about animals in our care is not easy, and it can be even more difficult when it’s for behavioral reasons. In this presentation, I’ll begin to explore the decision-making guidelines shelters use and the reality of individual case-based decisions. Understanding our perceptions about how we think about euthanasia choices can help us explore how to improve the decision-making process and lead to new, creative opportunities to save the lives of more sheltered dogs. euthanasia-related stress can lead to negative emotions. In this talk, I’ll discuss the factors that contribute to moral injury and emotional dysregulation and eventually lead to burnout in animal shelter workers. Meet one of the most common phrases in scientific research reports. This phrase isn’t simply there to keep researchers in business. Questions beget questions—that’s how the scientific process works. But this shouldn’t suggest we’re entirely in the dark about dogs. This talk focuses on where we are now: what we do know about dogs and their relationships with people, and how we can use what we know to help dogs today.